No, that is NOT cranberry sauce. It's better!! This sounds complicated and a little on the fancy side. Well, it's not complicated, but it is "special." And what if I told you that the only two things you may have to buy are some pork chops and apples? I kid you not. Every other regular kitchen I know will have everything else that is used. Except maybe the red wine… But shouldn’t every kitchen have a bottle – if not for in the food, for in the chef? The chops with the rub, ready for the broiler. I wanted to have something cheap for dinner. It may not seem like it, but just like everyone else I have a budget that I try to stick to for groceries. As such, when I go foraging at the grocery store what I decide to make is often determined by what I can find marked down or on sale. Today at the store I found boneless pork rib chops ($2.99/lb) and Fiji apples (99¢/lb). 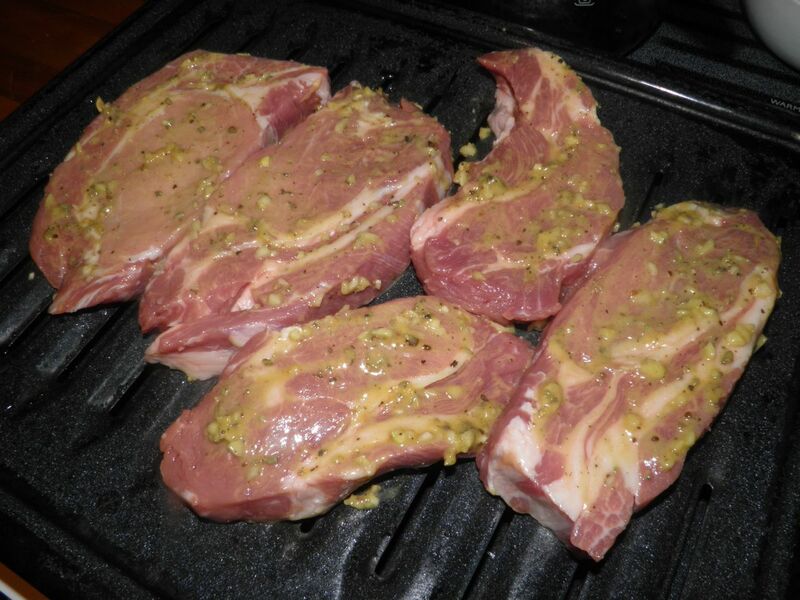 The chops were nicely marbled and perfect for broiling. If possible always buy fat marbled pork for grilling or broiling. It keeps the meat moist. Lean pork usually ends up as a dry piece of leather. I escaped with enough food for four for under $7. How’s that for frugal? A test of how well you know your kitchen is how nimble you are in thinking up recipes on the fly – like when you’re standing in the produce department. A good cook knows what's already in their larder and then only buys what they need. It opens up your creativity if you know what combinations you can make with what you already have. It's actually easy. We've all eaten many meals. Just think of what went together… Once I found the pork I went running to the apple display. 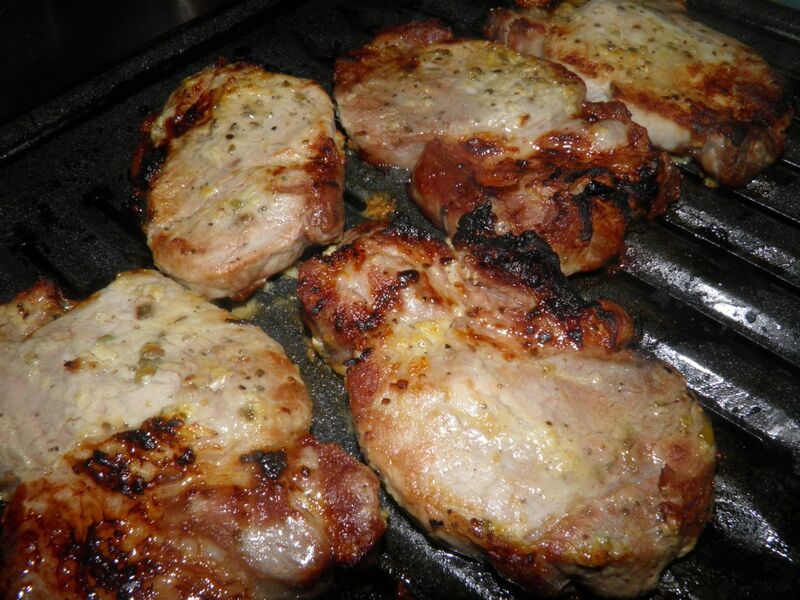 Pork chops and apple sauce are a standard. Then I had to figure out what went with both. Mustard, garlic and sage became the basis for my rub since they all pair well with pork. I added a little brown sugar help brown the exterior of the chops, and salt and pepper were no-brainers. what colour it would end up being. The apple “sauce” was a different matter, slightly. To “spice it up” I switched out the water for red wine. After all, the bottle was just sitting there on the counter begging to be used. I also added a little cinnamon (usual) and sage and garlic (both unusual). I could have even added a touch of Dijon if I wanted, but resisted the urge. The sage and garlic make an interesting, slightly savoury apple mash, which is great with any pork cut. 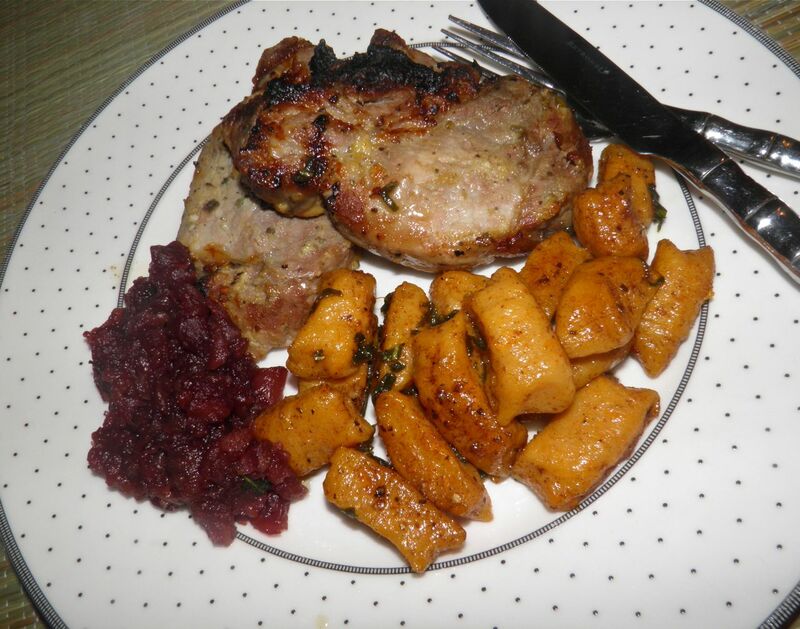 So I had pork chops and apple mash, each with varying quantities of sage and garlic. Each had its own high accent, but each the same base. To complete the lack of effort required to make this dinner, choose a side that doesn’t take a lot of work, like rice or couscous. I happened to have some frozen sweet potato gnocchi leftover from 2 weeks ago (recipe here). They are as fast to boil as couscous is to sit. I then tossed them briefly in a butter-sage-garlic sauce. Perfect! Combine all the ingredients except for the chops in a bowl. Rub the mixture over the chops. Broil the chops for about 7 minutes per side, or until done to your liking. Let rest for 4-5 minutes before serving. Pare, core and slice the apples. Combine with the remaining ingredients in a sauce pan. Bring to a simmer, cover ad let cook for 20 minutes. 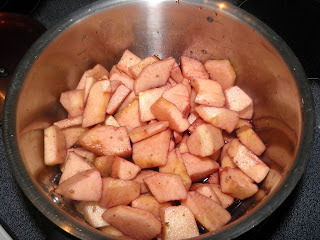 If the apples are not broken down enough give them a light mash with a potato masher.